The other day I was chatting about cider with someone who I had just met and they asked me how I became interested in cider and when I thought the market started to embrace it here in Australia. My first true cider introduction came about whilst visiting a friend in London. 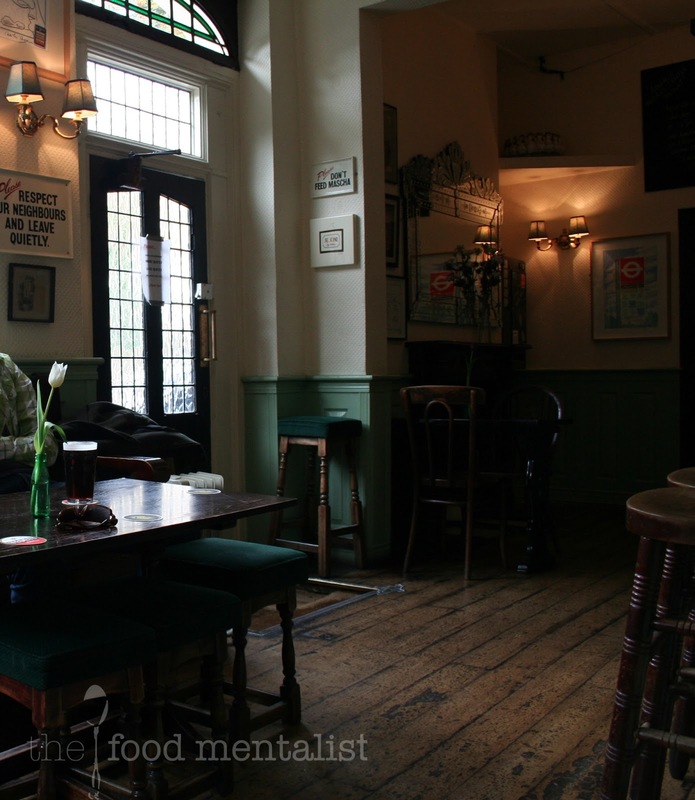 He suggested that we visit a local pub for lunch called the The Charles Lamb. It was a great little spot and very quaint with great British pub fare. Not being a beer drinker, I opted for a cider to have with lunch and was really surprised when I took my first sip and it had been served at room temperature. All I can say was after that I was hooked. Before we returned home to Australia we also spent several weeks in France where my curiosity for cider was cemented. That was late 2010, and when we returned my cider obsession took off. It wasn't until mid 2011 when I started to notice the trend really shift and only recently that I have noticed more traditional ciders like those I sampled in London and France coming through. That said, I am still not sure how the Australian market will receive them, given that majority of cider consumers I talk to are still very much in favour of the sweet commercial varieties. Everything has it's place though, right? 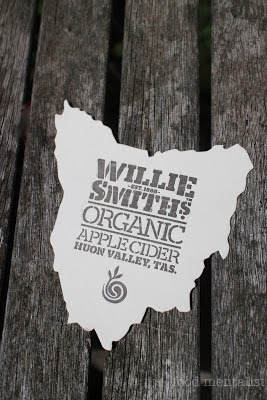 SO, this week I am really happy to introduce Willie Smith's Organic Apple Cider made in Tasmania's Huon Valley - one of the most pure and untouched places on earth. The Smith Family have an impressive history in the region, with William Smith planting the first tree for the orchard in 1888. Similar to the cider at The Charles Lamb, this cider is best served slightly warmer than fridge temperature. Serving a traditional style cider too cold ( or with ice) is practically a sin, as it mutes the complexities and flavour of the cider. To start they handpick all their apples and using a press squeeze out all the juice. The juice is then fermented in stainless steel vats with two different types of yeast from France. Following a secondary ferment, the cider is then aged in French oak vats for up to 6 months. The final stage involves 'maturing' the cider in special maturation tanks for an additional two months before the cider is ready to be bottled. Australian certified organic the Smith family are passionate about their product, adopting a holistic approach to everything they do. From the soil and plants to the food, people animals and environment in which they operate. Contain more anti-oxidants such as phenols and salicylic acid (known to protect against cancers, heart disease and many other health problems). 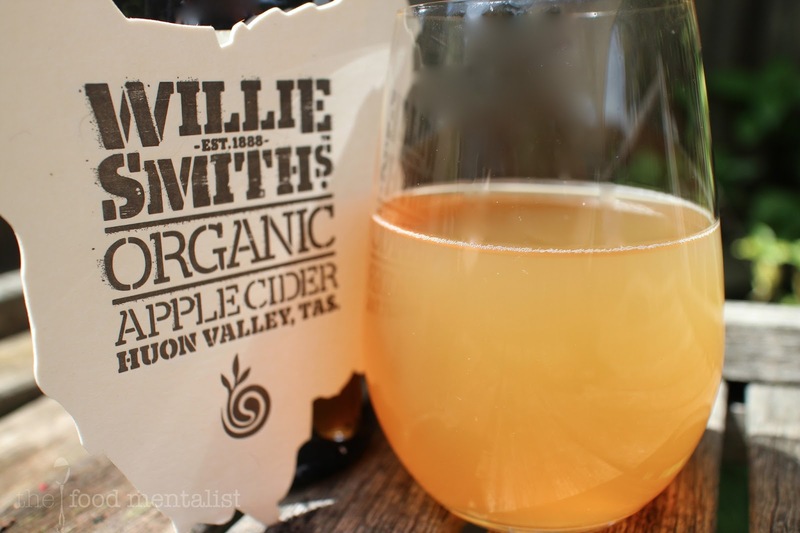 Pouring a glass of this cider reveals a gorgeous golden coloured, slightly cloudy cider. This cider has a lovely aroma, with sweet apple and earthy notes coming through. It has a very fine carbonation and is incredibly light and well rounded on the palate, with a nice cleansing finish. Like the rest of the cider, the sweetness is very well balanced. I really really like this cider. When I drink this cider, many different food pairings come to mind. Serve with a nice cheese plate, pork roast with root vegetables, crackling & jus or with a piece of caramelised apple cake and double cream. Yum! At 5.4% , a 330ml bottle will provide you with 1.4 standard drinks. 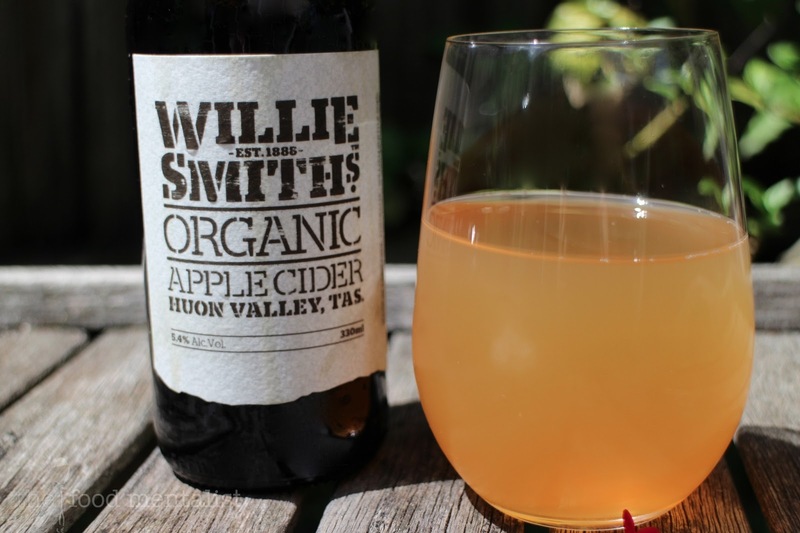 The Food Mentalist sampled Willie Smith's Organic Cider compliments of the Smith Family. I love my ciders and am keen to give this one a go. Have you tried Pagan Cider's cherry cider?